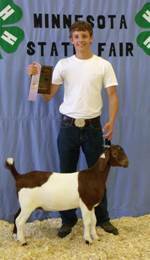 Available starting April 13 (2013) at our “Venture to the Farm” event, pick from kids out of Delta’s Reign, sire of the 2011 Overall Grand Champion Market Goat at the Minnesota State Fair. We’ve also have a lot of paints and red kids out of Prairie Fire, son of Son of BACKDRAFT *ENNOBLED* and new this year is PHIL the Flasher, son of HC FLASHER *ENNOBLED*. We expect to have about 70 kids to choose from this year. Visit our website vkvboers.com for more info, email goats@vkvboers.com.